The simple template app created using the flutter create command has its uses. For a beginner it can be helpful in showing the simple use cases and state management of Flutter. But sooner or later the default template becomes more of a hassle then a help. Deleting the lines of comments, renaming the horrid widget names, and transitioning away from StatefulWidgets to the BLoC design pattern. Often times, you end up just deleting the original main.dart file and starting over — which makes you question why the template is there at all. While searching for another tool, I stumbled across this templates folder. 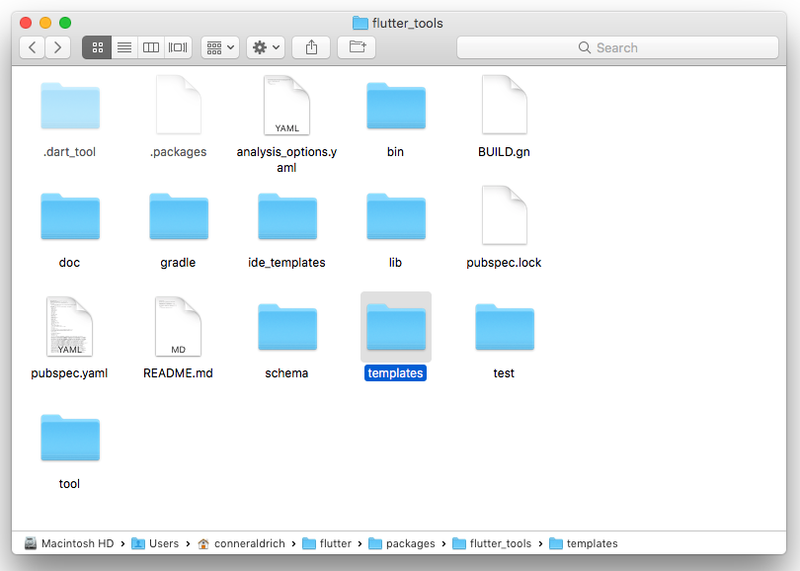 Here you will find the default template used when running flutter create or creating a New Flutter Project in Android Studio or IntelliJ. You can edit any of these files, but /lib/main.dart.tmpl is the real goldmine. A lot of the text here will look unfamiliar because it handles the formatting of the file and what to leave in or out when you run flutter create with specific options. But if you stick with what you know, you can easily find and then edit code like this. // or simply save your changes to “hot reload” in a Flutter IDE). I went through the entire file to remove the comments and take the My out of the widget names. I also changed the StatefulWidget to a stateless widget and transitioned the template app to the BLoC design pattern. Be careful what you do in this file, because it could seriously screw with your flutter create command. But if you do this right, it will be extremely helpful in saving previously wasted time when creating new projects.